LNC Home is a shopping destination where you get all sorts of the modern-antique lighting and décor pieces. All the products there are attractive, stylish, and versatile in use. You can use them for its purpose or just as a piece of décor to adorn your home. Where to check for online curtain solutions? Does Half Price Drapes sell quality fabrics? What about the price tag – Is it affordable? Read on and check for the listed coupon codes available. What I really liked about LNC Home is the sheer collection of products. You don’t get to see this much of antique and retro items that you really wish to grab hold of each and every one of them. LNC home also offers wide range of products from lighting, antique telephones, furniture and décor pieces. The lighting category holds up to 11 categories, telephones are to be chosen from 4 categories, there are the bamboo shelves and on the other hand is the bamboo bath mats. Let’s get deeper into these products and categories. 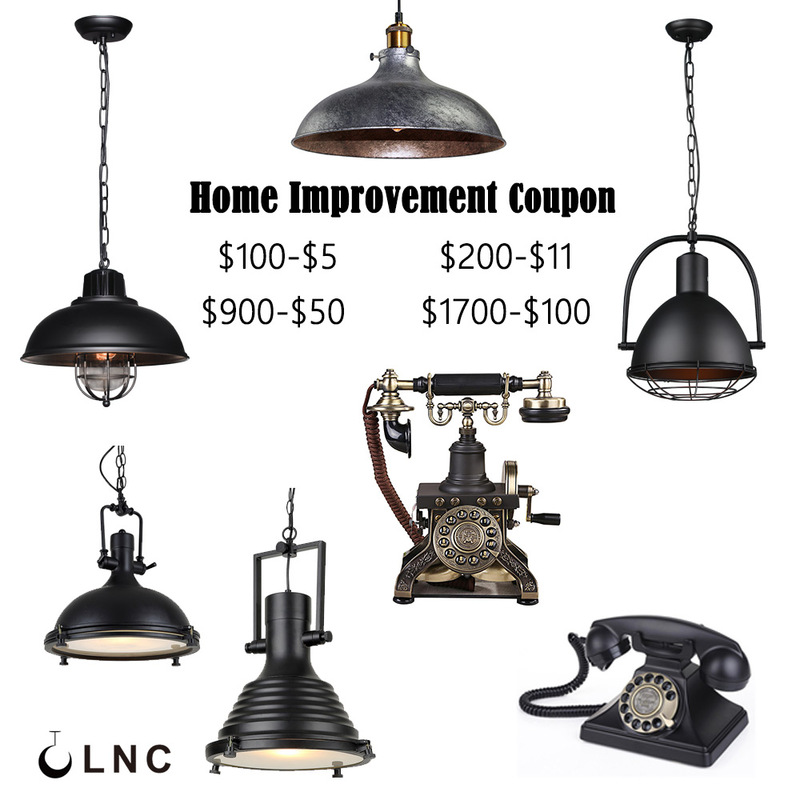 The lighting collection at LNC home shouts antique, vintage, and retro. If you are planning for a retro themed home décor, this is the right place for you to choose you picks. The products do come under the retro but it also has the modern appeal to entice anyone. Chandeliers are the life of the living rooms. It has come out of its living room-dining room skeleton and is now being flaunted in every room. There are no rules for chandeliers now. The modern interior designing calls for a different theme for every room in a home. These antique styled chandeliers can suit any of those room décor. It sure can improve the ambiance of the room. The bestseller chandelier at LNC Home is the LNC Antique black iron rustic chandelier and the LNC Vintage style resin deer horn antler chandelier. LNC Antique black iron rustic chandelier: LNC Antique black iron rustic chandelier needs 6 bulbs to light up. The glass shades are also designed to have the old days back. The black iron has its charm and can suit any themed room. Fairly suitable for the living room, dining room, or study at homes or in the restaurants or bars for best look. It looks best in a room with an area of 15-20 sq meters. This LNC chandelier measures to 28 inches in diameter and 22 inches in height. The chandelier requires 110V to power up and the base model is E26. It can accommodate bulbs with a maximum wattage of 60 watts individually. The bulbs are not included with the product. LNC Vintage style resin deer horn chandelier: LNC Vintage style resin deer horn chandelier requires 8 lights to light up. The lamp shades are shaped in traditional lamp shade look alike. It is a fairly large chandelier with a measurement of almost 40 inches in diameter and 19 inches in height. The material used in resin and cloth to complete it. It is styled in vintage rustic look. it is available in only brown color with a yellow lamp shade. It needs 8 bulbs with a maximum wattage of 60 watts. The recommended wattage is 25W for individual bulb for its perfect look. LED bulbs are the perfect choice. This chandelier can easily grace any room that you choose to. The light faces upwards. LNC Vintage Industrial pendant light with metal shade: This is a single bulb pendant light with a dome shaped shade made of metal. It measures to 14 inches in diameter and 6 inches height for the lighting part. The maximum height from ceiling could be 39 inches altogether. The base type is E26 with a preferred LED bulb. Use only a maximum wattage of 60w for the bulb. This light is perfect for a farmhouse or similarly themed home. LNC Vintage metal finish chandelier pendant lamp fixture: This is a chandelier type pendant light with the lights arranged horizontally there are 5 lights set at 3.9 inches from each other. It runs along 26 inches and can be hung at a maximum height of 39 inches from the ceiling. It is perfect for a vintage dining area, the kitchen island, bar etc. Wall lights are accenting the walls, increasing the ambiance, and add beauty to the room it is installed in. in rooms that are not wide enough to have a large chandelier or pendant light can sure flaunt a wall sconce on the wall that is most convenient. It can also bring focus to any particular area of the room that you wish to. Having the antique design will add attraction. Here are my pick of wall lights from LNC Home lighting. LNC Antique iron wall sconce: This bronze colored antique wall sconce has a glass shade. The metal used is iron with resin and then painted bronze. The iron used is designed and made artistic. With some expert brush strokes, it almost looks like a painting. It is a single bulb light with an E26 base. This traditional style wall light measures to 7 inches long, 9 inches wide, and 14 inches in height. It can be used to light up an area of 10 sq meters. It can be used as a single piece or in pairs for more aesthetic look. LNC Retro Industrial Swing Arm Iron Wall Lamp: Not all wall lights are fixed and unmovable. This industrial swing arm iron lamp is fixed on the wall and can sure call it a wall light but it acts as a lamp for you. Install it near the bed; you have a retro side lamp actually fixed on the wall. You can swing the arm to get nearer for the night time reading. The lamp shade is 7.5 inches in diameter with a total length of 27 inches for the arm. It requires a power of 120V. The porch is where someone gets an impression about your home so, that increases the importance of porch lights. A grand looking porch lights can illuminate the entrance and welcome the guests. The same applies for the balcony, patio, yard etc. There is no differentiation for these type of lights for its installation place. They are just outdoor lights. LNC Cottage patio/Porch light is in traditional cage style with a single light inside. It suits well t be used anywhere on the outside wall of the house. It is made of aluminum alloy with black finish. The lamp is 15 inches high, 5 inches wide and 5 inches long. The base of the light bulb is E26 and the bulb should be a maximum of 60 watts. The lamp shade is metallic framework with glass. LNC Outdoor barn lantern rustic aluminum pendant light is another option for a porch or patio light requirement. The light is shaped as a barn lantern with rustic look. it can be hung at a height of 18 inches from the ceiling. The lantern part is 13 inches long and 8.7 inches wide. This is a perfect addition to a patio or balcony. The bulb base is E26 and can use a bulb type E12. The lamp shade is smoked glass. There are only 3 options for the kitchen island lights. This is where I am pretty much disappointed. They are not that attractive looking. All are industrial kitchen island lights. Of the 3, two are similar with only difference in the way the lamp shades are fixed. Its downwards in one and upwards in another. The third one is rectangular shaped with crystals hanging out in two tiers. One can choose one of these only when there is no other way and they really have to choose one. Table and floor lamps would never go out of fashion. No matter what the style is, they are here to stay as permanent as possible. The lamp collection at LNC Home is limited with most designs in the antique retro styles. LNC-1 light vintage industrial swing arm table lamp is black in color with a semi-sphere lamp shade. The lamp is made of iron and zinc alloy. The arm swings to both directions. The length of the arm is 15 inches; lamp shade is 4.3 inches in diameter with 4 inches high. The lamp requires 120V power. It can accommodate bulb type 12 in its E26 base. LNC Antique tripod floor lamp metal stand with light shade is the old fashioned floor lamp. It has 3 metallic legs on which stands the lamp shade which is cylindrical. The lamp shade has 16 inches bottom diameter and 11.8 inches on the upper side. The tripod is 50.4 inches high quite remarkable for the height. The industrial lighting category includes an assortment of lighting types from all other categories. They are made in either vintage style or in retro style. The lighting can be used for industrial or domestic use. The products in this category are an ideal choice as a gift for veterans from the olden decades who loves anything about vintage. There are spot lights, ceiling lamps, wall lamps, etc. Traditional lighting includes all the lighting that is designed in the traditional style. The Rustic lighting has all types of lighting made of resin designed as deer horn. The Modern lighting is, well, the modern lighting with some having a retro, antique twist. Some lights have antique design or metal while others have the glass shade that has the antique character. Surf through the items to see what interests you. If there is anything that can be useful and at the same time grace the interiors, it is the retro telephones. In olden days it used to be a luxury, convenience and kind of intimate hat brings people closer. As the world got modern, this convenience took a new turn and became retro items, antique piece, and most importantly a décor item. The retro telephone collection at LNC Home is quite interesting. It includes variety of the olden days telephones made to bring in new and attractive look. There are antique pieces, ceramic telephones, metal telephones and resin telephones for you to choose from. The most beautiful telephone choices are in the ceramic category. I just loved all of those. It has its elegance. The telephones are also brought to the modernity with the push buttons instead of the rotary dial as in the olden phones. Only a few of those telephone connections have the rotary dial in it. The phones even have called ID display panel. It works well and rings the old fashioned, old phone, which many still longed to hear. There are many telephones to choose from. The majority are white in color. There is only one black beauty. The most popular ceramic telephone from LNC Home is the LNC Silver rose flower ceramic push button dial desk telephone. This ceramic telephone has the telephone, handset, a line to connect, and a user guide in English on how to install it. The floral design on the phone makes it all the more worthy. It would be an ideal addition or gift for someone who is fond of the floral designs. It can make its own special space, no matter where it is placed. Another choice would be the black beauty- Black ceramic antique push button dial desk telephone. The elegance of black is decorated with gold. The designs on the telephone are also done in gold. Place it in the living room, study, or in the guest room to make an impression! Whenever I hear the old phone ringtone, it reminds me of the black metal telephone with a rotary dial in the middle. Though I never thought it when I had it earlier, the fact is, it was really super cool. Now I get a chance to have it back. LNC Home offers this metal telephone in its former glory. The metal telephones are available in different designs, the black telephone, antique style, retro style, classic style, and the most interesting candle stick model with a separate mouth piece. All of these metal telephones flaunt a push button instead of the rotary dial. All except the classic style black telephone. The rotary dial is antique colored without losing its elegance. The phone is ideal for home or office. Use it as a telephone or as a decorative piece. It is rather on the heavier side with a weight of about 4 pounds. The phone does not have any modern facilities in it. But yes, it has a redial button so that you don’t have to go round and round to make a call to the same number. This telephone could also be connected to an answering machine if you would like to. That is all the modernity you can get out of this. There are only 3 choices for the wood telephones at LNC Home. But boy! Is that worth it? Yes! It is made of wood and antique metal. It has the sophistication of both the wood and metal together. It comes in 3 different styles as well. You get to choose from 2 push button telephones and one with a rotary dial style. Whether it is the wood finish or the metallic design, the artistry is definitely a look for. The phones have the normal functionality with a single line only. There is the last number redial facility also. The caller ID display is seen in the middle of the dial. Made in the vintage retro style, these wood telephones are sure to make an impression in the living room, study, office or anywhere. It also makes a perfect gift for antique lovers to be gifted on special occasions. All the packages have a telephone, one handset, single line for connection and a user guide to help you with. The wood used here is resin wood. Must tell you, these telephones ARE heavier and of course a bit on the costly side as well. Resin telephones are of many choices at LNC. You can have telephones in white, brown, antique colored, bronze colored etc. They are all classic looking design that shows the excellent workmanship. It is both functional and aesthetic. Resin is used to make the body of the telephones along with metal. The telephones use push button for you convenience. It also has a caller ID display screen in the middle and some even have the redial facility. The telephones are a bit pricey for my taste but I am sure that it can enhance the beauty and attraction of anywhere it is placed. There are the classic telephone shaped telephones and there also are the vintage horse and dial designs as well. You get the rotary dial in only two choices, the rest all have the push button facility. Other than the lights and decor telephones LNC offers some bamboo products also. There are a few choices for the bamboo shelves and the other section is for the bathroom rugs. Bamboo has its place in the nature as well as in the interior designing. Here, there is the book shelf, corner shelves, bath caddy etc. all made from pure bamboo, without disturbing the Mother Nature. There are a few options for the bookcase. The shelves differ in their size and shapes. Number of racks is almost the same, 4, in all of them, except one. Otherwise the basic nature and purpose of these bookcases is the same. Bookcases are large and mini-size. The shelves have 4 tiers that are detachable if you want. The shelves are 12 inches apart from one above. The dimensions for the large bookcase are 47 inches high, 22 inches long and 12 inches wide. The mini-bookcase is also 47 inches high but less in width and length. They are 18.8 and 12.5 respectively. The furniture comes in the original color of bamboo- beige. It is nothing fancy, but a simple and attractive looking bookcase for home or office use. The bookcase comes in parts and necessary tools. It does not take much to assemble the unit and is pretty easier. The LNC storage shelves have the square racks. The number of racks varies with the size and the options are 2, 3, and 4. They are all of similar shape so that when placed next to each other makes a larger looking shelf with a gradient height. Quality bamboo used for making and durable for long term use. It is a perfect addition to any home or office. It can also be used in the bathrooms. The basic measurement of the shelf tiers is 13.3 x 13 inches. The height of the shelves is 31.4 inches, 43.3 inches and 55.1 inches for the small, medium, and large sizes. is 3 tiered. They fit conveniently to the corners. The bamboo looks attractive, easy to assemble and easy to clean as well. It is ideal for any living room, study, bathroom, closet, or office. It is sturdy enough to carry some weight. The racks are 11.8 inches on both sides of the corner. The height of the unit differs with the size. The height of the larger 5 tiered shelf is 51.1 inches, and that for the medium sized 4 tiered is 42.9 inches and for the smaller one it is 38.5 inches with 3 tiers. The bamboo clothes rack from LNC is a beautiful piece of furniture. It has the appearance of a small swing with wider base and narrower top. The unit measures to 65 inches in height, 27.6 inches long, and the width would be 17 inches at the bottom. There are two shelves and a higher rod to hang the clothes. The bottom shelf is 17 inches wide and upper shelf is 13 inches wide. The shelves are 15 inches apart. There are castors fixed on all 4 corners for its easy movement from one place to another. The unit comes in pieces that you need to assemble it later. All the necessary screws and tools are added in the package. LNC bamboo products include the bath mats, foldable rugs and a bathtub caddy also. The bath mats and the rugs are of two sizes, all made of bamboo. Bamboo bathmats: The first type of bath mat is small with a dimension of 19 x 12 inches in length and width. The larger size is 26 x 18 inches in length and width. Both the bathmats have rubber grid underneath to keep it on the shower floor. It does not skid and makes the feet feel better. The mat is elevated so that the water easily drains out. The natural bamboo evaporates the water and is quite durable. Bamboo bathroom rugs: The bamboo bathroom rugs are foldable and made of this strips of bamboo. It can be rolled for storage after use. It has all the goodness of bamboo with easy drainage and moisture resistance. The rugs are skid resistant, and made of natural bamboo. It does have rubber grip under every strip of bamboo used and stick to the place where it is placed. The rug comes in 2 sizes; one is 24 inches long and 16 inches wide. This one has the bamboo strips arranged parallel to each other. The bamboo strip used has a thickness of 0.55 inches. The other one is larger is size with a length of 28 inches and width of 20 inches approximately. It uses thinner strips that are only 0.31 inches thickness. These strips are made into a woven design with small sizes bamboo pieces to make the rug. The pieces are string together and rubber grips are also provided on the underside. LNC Bamboo bathtub caddy: Bamboo is available in the bathtub caddy form as well. This bathtub caddy is larger enough to fit all tubs. It has a grooved space in the middle and the handles space on the sides. The entire caddy space can be utilized. The caddy measures to 27.5 inches in length and 5.7 inches wide. The height of the caddy is 1.7 inches in the middle area. It comes with a gloss finish to avoid any water stains on it. It is a great addition to any bathroom and can be bought together for a complete bamboo ensemble. If there is any plant that is completely safe to cut and not cause any deforestation or cause global warming, it is bamboo. Bamboo plant can grow faster and does not cause the harm that is caused by cutting down the trees. Bamboo is not a tree, it’s a grass that grows higher and wider. Bamboo can grow bigger within a matter of weeks. The goodness of bamboo is that it is durable resistant to moisture or dryness, can carry weight, and is more flexible than any other wood. Moreover it is completely environment friendly. Bamboo is more durable than other hardwood. It can carry much more weight as well. The best part is that the durability is not majorly affected even when it is laminated in strips or pieces. Bamboo is naturally resistant to moisture and can avoid any fungal or bacteria growth in it. This moisture resistance makes it good against any wood swelling in the damp season. It is also resistant to over dryness. Most wood can dry in the hot and dry season and might even lead to cracks on them. Bamboo does not have this problem and can be used in type of weather condition. Bamboo is light weighted than other wood and can also carry weight that is much higher than itself. It is easier to move the bamboo furniture while you redecorate your home. It can make a style statement in itself. Bamboo being a grass is more flexible than other wood types. It makes it easier to make different designs and shapes with this. The natural look and color of bamboo is also acceptable with almost all of the designs. Bamboo is the most eco-friendly wood. Not only does it grows faster it can be cut several times and still grow into a new and large plant within no time. The most advantageous feature of bamboo is that it can reduce the carbon dioxide from the air. Bamboo can absorb the carbon dioxide from the air making it purer. This also helps in countering the global warming phenomenon. How to order a product from LNC Home? You can go to the LNC home online store and pick your products. There you will be asked to ceate a free account with email ID and password. This account helps you shop faster and also keep track on all your orders as well. You can also purchase it from Amazon dealer. You will be redirected to Amazon where you can place the order. Is there any shipping charge for the LNC products? No shipping is done free of cost for all products at LNC. The shipping will be done within 3-7 days of order and will also be delivered within this time period. The duration depends on the destination. Can I get the LNC products shipped to Canada? Unfortunately, no! There is no international shipment from LNC. All shipments are limited within the USA. What if I am not happy with the product I have received from LNC Home? In that case you may return he product for a replacement or for a refund, whoever you prefer. This has to be returned within 30 days of initial purchase. The return shipment will be charged by the customer. The return should we wrapped in the original package. Inform the customer care before hand with details of your order and image of the complaint. The catch is assembled products do not get to be returned.